Hi it seems that Vungle can't response to Heyzap. Screen shot attached. The Heyzap SDK will automatically detect and initialize the SDKs from 3rd-party networks. Some 3rd-party networks fail when initialized multiple times. Please do not initialize or otherwise directly interact with 3rd-party networks mediated by Heyzap. I will give this an update soon. Thank's robin.I tested the game again and it shows Vungle ads properly.But in Heyzap dashboard that message is still showing...I think the dashboard is not real time.So I will wait for heyzap dashboard to be refresh because ads is showing properly now from vungle. If you already purchase the extension, login to your account to re-download the update version. the new version of this was not working when I tested on iOS 10, it loaded the advert but failed to show. Im using it with the hey zap extension. Ive switched back to the old extension and its working correctly. Working on updates to get work with new Heyzap SDK 10. Hope i updated all the extensions end of this week for both iOS and Android. Man, I feel so bad for pestering you all the time Rob I swear I'm not following you. anything I have missed here? 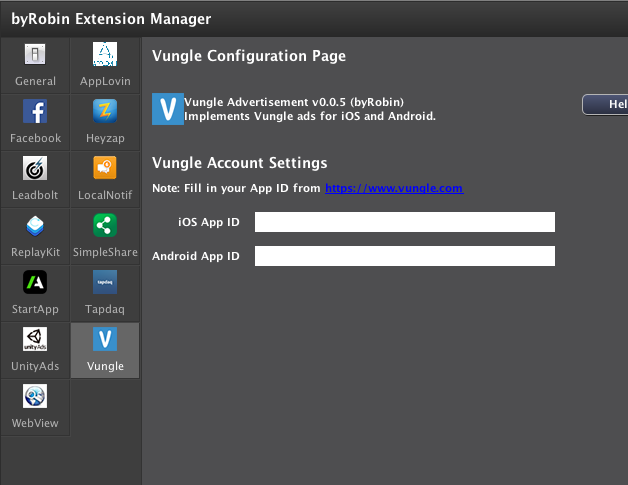 Scroll down to the section if you also installed UnityAds, facebookads,Apploving and vungle. Download the frame work and replace with the one in the Vungle frameworks folder. Ah yes, sorry. I remember those extra features, but just wasn't sure. - Added Android Gradle support.